BQool is excited to announce the next repricing update will be launching in mid-April. We’ve been working closely with users to ensure the latest update is packed with features and improvements that will help our users achieve repricing success. The update is currently in beta testing where we are gathering feedback and checking the performance of features to ensure a smooth launch. We’ll be updating our Support Site and Youtube channel with support materials in the coming weeks. We will also be announcing a webinar to kick off the launch, so please stay tuned! Here is a preview of the changes you can expect in the next update. Accelerated Repricing (15 minutes) will now be available starting at the $25 plan. Existing $25 users will automatically be upgraded from hourly to Accelerated Repricing. For users who want even faster repricing, Accelerated Plus (5 minutes) is available starting at the $100 plan and above. In addition, we have changed our listing structure to count by the number of listings repriced instead of total inventory, giving you greater flexibility than before. Listings will now show sales rank, Buy Box win %, Buy Box owner, and position, which are critical for making strategic pricing decisions. The Competitor Analysis now includes which seller is in the Buy Box, competitor handling time, expedited shipping status, back-ordered status, and back-ordered date. Save time and start repricing faster by assigning default values for new listings as they are downloaded into BQool. Values you can set include: Min, Max, rule, and cost. 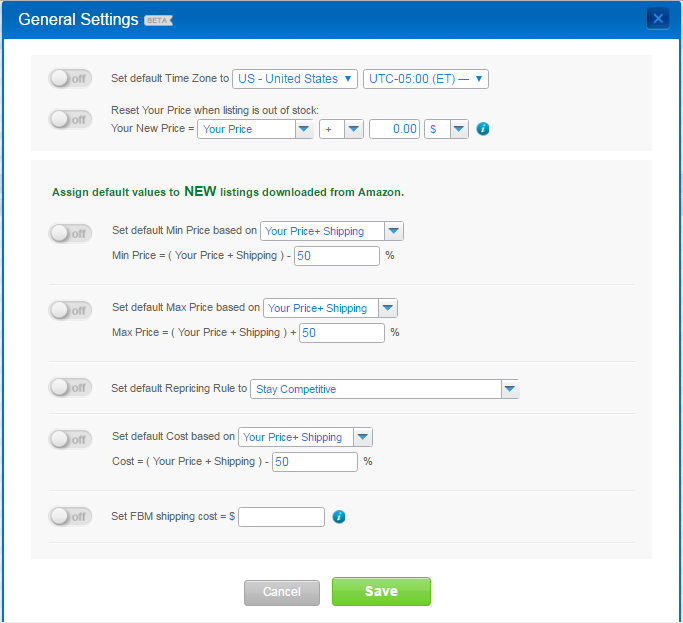 For out of stock listings, automatically reset your price while you restock your inventory. To set up listings manually try the improved Bulk Actions with new options to filter by group and listings which don’t have Min, Max, and rule. The repricing rule has received a major upgrade with options for repricing against the Buy Box price, excluding back-ordered sellers, and sellers with long handling times. New options for competing by sub-condition are great for book sellers. The safety net feature protects against one-time price drops. And finally, the scheduler lets you pause, restart listings, and reset your price each day. We’ve added business reports to help you better analyze your repricing performance. There are new reports for Buy Box Win %, Estimated Profit, Compete vs. Amazon, FBA, and FBM %, Lowest Price Win %, and more! If you have any questions about the launch please feel free to email us at support@bqool.com. If you haven’t tried out these powerful features, start your 14 day free trial now!